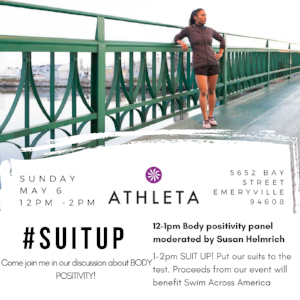 ATHLETA #SUITUP! Body Positivity Panel and Swimwear Testing for a cause! Join me and my fellow local fitness influencers at one of my favorite shops for activewear! We are talkin' BODIES, baby! We're kicking off the event with a BODY POSITIVITY PANEL discussing what Body Positivity means to us and how we can support each other in sharing our stories of challenges and empowerment.